My cousin Rocks! She started researching food production and she took her new shock and awe and did exactly what I did… she turned that energy into something productive. She is very much on board with the vegan/raw movement and she is making the important and necessary changes for the health of her family. I am so proud of her! Hard at work in the kitchen, she’s experimenting and trying new dishes that not only taste good, they are good for you. The best part is, she shares her good finds with me. She is an awesome cook! How exciting that I could just relax at her family parties, knowing I can graze on anything at the table! Could there be a family raw/vegan restaurant in our future? We might just change our family’s reputation from the family of Hair Stylists (although she isn’t a Hair Stylist, she escaped that gene, lucky her) to the family of passionate and healthy foodies. I am all good with that! My other cousin, sister and dad are also on the right train… My dad being very much vegan now, and wow did he turn his health around! Recently, my cousin served this Tempeh recipe she found, at her daughter’s birthday party. It was so delicious! I went home and had to make it, but of course I didn’t have the exact ingredients on hand… so this is the twist I came up with. It got rave reviews! At least I hope my husband wasn’t just being nice. He happens to be a great taste tester (and sport) for my recipes. Some days he gets a little luckier than others! And we are still talking about the food here. Fill a medium saucepan with 2 cups water. Rinse quinoa well in cold water and add it to the saucepan. Bring to a boil and add concentrated vegetable broth. Stir, reduce to a simmer, cover and cook down until water is absorbed and quinoa is tender, about 15 minutes. While the quinoa is cooking, add the Power C smoothie to a bowl. Add the grated ginger, Tamari, rice vinegar, maple syrup, ground coriander and garlic. Mix this and set it aside. Cut the Tempeh into 3rds, then diagonals, then turn pieces on their side and slice in half again to make thinner triangles. You could even cut these again to make them more bite sized. Heat the coconut oil in a large fry pan over medium-high heat. When heated, add the tempeh and cook 5 minutes per side until golden brown. Add the Power C mixture and simmer for 10 minutes, being sure to turn the tempeh while simmering. Serve the tempeh over the minted quinoa, spoon the sauce over the top and finish it off with a squeeze of lime and a sprinkle of sea salt, which really helps to bring out the flavors in this dish. Garnish with mint leaves if desired. It’s been in the teens and single digits for days here in Chicago. I’m cold. I have a bad case of cabin fever and I’m craving some sort of comfort food. I was looking around the kitchen wondering what to do with that butternut squash just sitting over there… waiting for me. Stuck inside as it snowed yet again, it was a good time to be creative. I was very impressed with the aroma’s that filled the house while this was roasting. I’m going to keep this in mind for a beautiful dish to present to guests. One whiff and they are sure to feel special. 1 14 oz Package Firm Organic Tofu, drained well and cut into 1/2″ cubes. I used Wildwood organic, high protein/super firm, no drain. 1 tsp Jarred Crushed Garlic. You can use Fresh, 2 cloves, minced. 1+1/2 tsp Fresh Rosemary. I used fresh that I had previously frozen. Sea Salt, Pepper, Agave. I added 1/8 tsp Himalayan Sea Salt and 1 tsp Agave. A dash of freshly ground Pepper. First drain tofu ~ While tofu is sitting and draining, make your marinade. Taste and adjust the seasonings. Keep in mind that roasting will bring out the sweet maple flavor and the salty flavor ends up a little more diluted. I added salt just in case. Cube your tofu and add to the marinade, cover and refrigerate for about a half hour. Preferably longer. Next, while the tofu is marinating, toast the walnuts and set aside. Peel the butternut squash. Be sure to use a good peeler to prevent an unnecessary headache. This is where I grew frustrated in the past and would hesitate to make squash recipes. I recently found an awesome peeler called the Titan, that really does the trick! Cut the peeled squash in half lengthwise, clean and then cut into 1/2 inch cubes. The smaller the pieces the faster it will roast. You want bite size pieces for this dish. When the marinade is ready, add the cubed squash, red onion and raisins to the tofu marinade and fold gently to coat everything. Be careful not to break apart your pretty tofu cubes. Once coated, transfer to a very shallow baking pan. I used a Jelly Roll pan. You can pour on every last drop of marinade or use a slotted spoon *see note below. Spread out evenly and put on middle rack of the preheated oven and roast for 12-15 minutes. Remove and carefully use a spatula to flip over as best as you can and put it back to roast for another 12-15 minutes. When done roasting, transfer it all to a beautiful serving dish. Serve alone, over Quinoa or Brown Rice and top with the toasted walnuts for delicious added texture. I divided my soy sauce in half with Bragg Liquid Aminos to reduce sodium. You can use all Soy, all Braggs, Tamari, or Nama Shoyu or whatever you prefer. After all, cooking is your art. *NOTE: You can make a side of Quinoa or Short Grain Brown Rice for this dish. Or it tastes great on it’s own. I added 1/4 cup more oil to equal 1 cup and made sure to use every last drop of marinade to roast this so I would have extra sauce to serve over brown rice, which gives an Asian feel or Quinoa for a modern comfort food feel. If you prefer to eat it alone, you may consider using a slotted spoon to lay it out on the roasting pan so it won’t end up too saucy or oily in the end. I made this new dish tonight that was very inspiring! You can enjoy this as an appetizer or main dish. Cinco de Mayo is around the corner, and this dish would be perfect for a party. 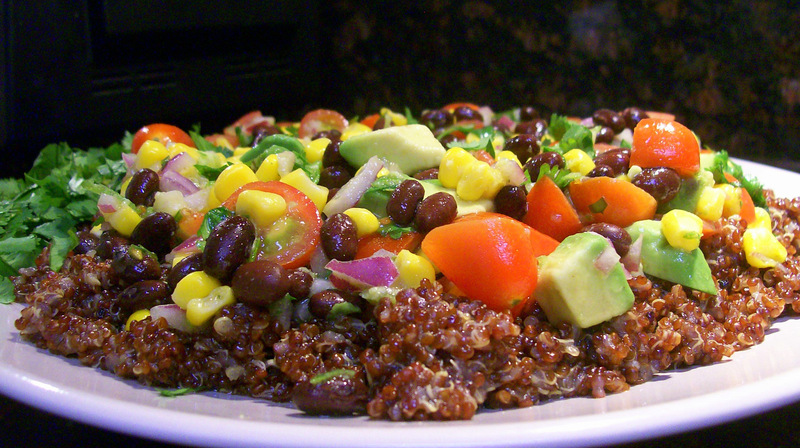 This dish was adapted and altered from the back of a Trader Joe’s Organic Red Quinoa box. Thank you Joe! The dressing recipe was altered from a Betty Crocker recipe I found. Thank you Betty! This could be served as a salad or as a main dish like I enjoyed it tonight. The warm red quinoa was amazing. This dish is beautiful, different and deliciously vegan! Updated on 6/24/13 – to make life easier. I just made this dish again over the weekend and tweaked the measurements and rewrote the directions to make it simpler to follow. I am happy to report, this dish was a hit as usual! Cook quinoa with broth according to package directions. 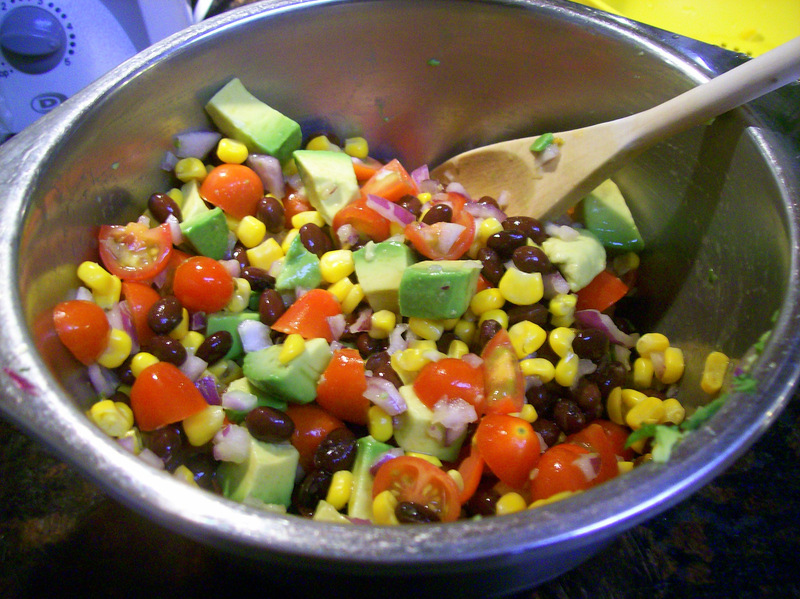 While quinoa is cooking, combine beans, corn, avocado, tomatoes and onion, lime zest and cilantro. Add the Cilantro dressing (recipe below) and toss gently. Taste, and add sea salt as needed to bring out the flavors. It may not need much more. I added a little over 1 tsp more. 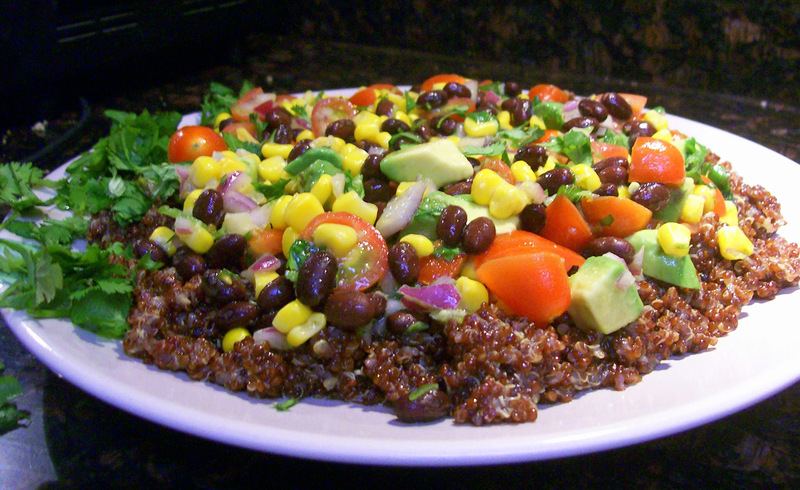 When quinoa is cooked, drizzle with olive oil, mix and spread evenly onto a large platter and top with the bean salad. Garnish with chopped cilantro if desired. Place all the above ingredients into a container with tight fitting lid and shake. Taste and adjust.